Chaidh Comunn Gàidhlig Thoronto a chruthachadh ann an 1880 gus luchd-labhairt na Gàidhlig a bha air às-imrich à Gàidhealtachd agus Eileanan na h-Alba a cho-cheangal. Ann an 1886 thòisich oidhirp gus rian a chur air Comunn Gàidhlig Thoronto agus chaidh a stèidheachadh gu foirmeil ann an 1887. Tha sinn air a bhith ann bhon uair sin. Ann an 1903 chaidh ar n-ion-chorpachadh mar "The Gaelic Society of Canada," le raon-obrachaidh fiù ’s nas fharsainge. Ann an 1940, chaidh ainm a’ Chomuinn atharrachadh air ais gu "The Gaelic Society of Toronto." B’ e bun-amas Comunn Gàidhlig Thoronto eòlas air a’ Ghàidhlig agus air a cultar a chumail beò agus luchd-labhairt na Gàidhlig ann an Toronto agus mu thimcheall a’ bhaile a cho-cheangal. Tron a h-uile atharrachadh air feadh nam bliadhnaichean, tha an Comunn air leantainn air adhart a’ toirt taic is cuideachas do chànan, eachdraidh, chultar, agus choimhearsnachd na Gàidhlig ann an iomadh dòigh, an dà chuid le gnìomhachasan a’ Chomuinn agus le bhith a’ toirt taic do dh’oidhirp feadhna eile a dh’fheuchas cuideachd ri cànan agus cultar na Gàidhlig a bheathachadh agus adhartachadh. 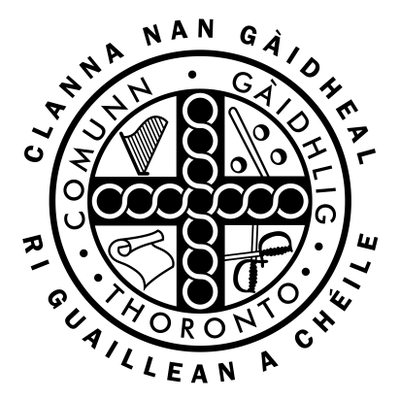 Comunn Gàidhlig Thoronto / The Gaelic Society of Toronto was formed in 1880 to connect Gaelic-speaking persons who had emigrated from the Scottish Highlands and Islands. In 1886, an effort began to organize The Gaelic Society of Toronto and it was formally inaugurated in 1887. We have been in existence since that time. In 1903, we were incorporated as "The Gaelic Society of Canada," with a still more extended field of operation. In 1940, the name of the Society was changed back to “The Gaelic Society of Toronto." The Gaelic Society of Toronto was formed with the goal of keeping alive a knowledge of the Gaelic language and culture and connecting Gaelic-speaking people in Toronto and surrounding areas. Throughout the changes in its structure over the years, the Society continues to support and sustain Gaelic language, history, culture and community in various ways, either through the direct activities of the Society or by supporting the efforts of others who also seek to sustain and promote the Gaelic language and culture. "Clanna nan Gàidheal ri guaillean a chéile. Children of the Gael, shoulder to shoulder." Here you can download Comunn Gàidhlig Thoronto's original Constitution from 1979. We are in the process of updating the Constitution to ensure its relevancy to the Society and our members. Thank you for your patience as we undertake this important work. Gu ruige seo chan eil bun-reachd a’ Chomuinn ri fhaighinn ach sa’ Bheurla a-mhàin.